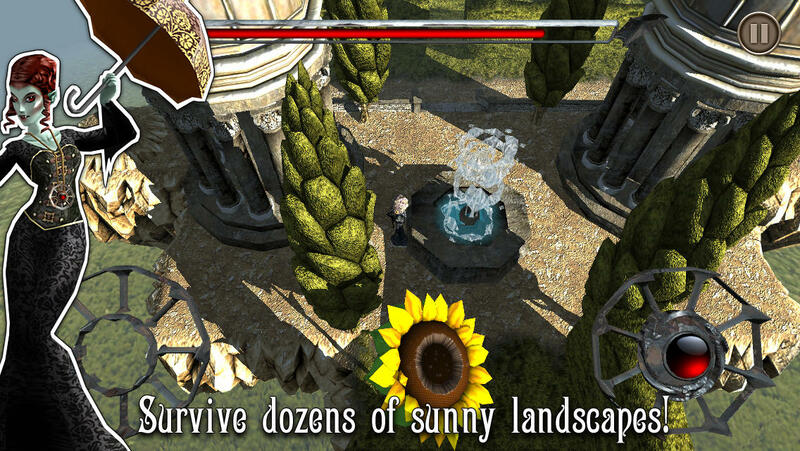 In Shadow Vamp [$0.99], you play as the laziest vampires ever. The game takes place over a series of floating islands. After sleeping the night away, your vampire wakes up and wants to cross the island, in broad daylight, to the next crypt, where he or she will snooze until deciding to move to the next island. It's a fun exercise, if a little rough around the edges. According to vampire lore, those pasty-faced devils loathe sunlight. (Excepting those who bathe in glitter.) In fact, they'll burn to a crisp from prolonged exposure. 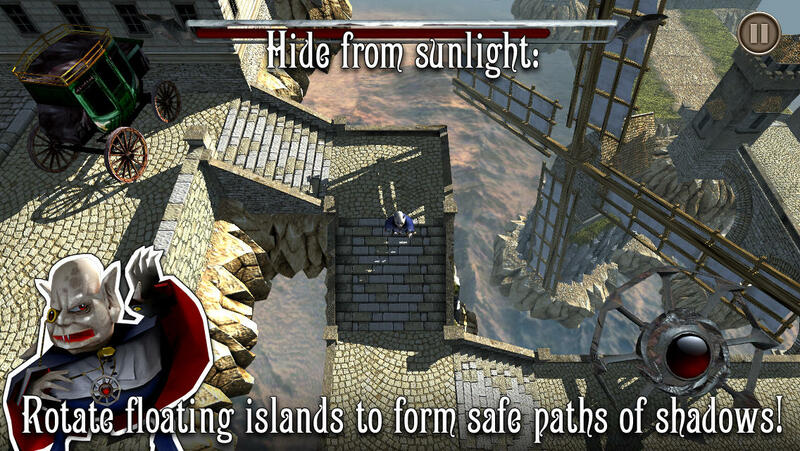 To cross each island without getting a tan, you need to dart from shadow to shadow. In instances where one shadow stretches too far in the opposite direction, you rub your thumb along a wheel that turns the island, causing sunlight to strike its towers, carriages, and other debris from different directions and create shadow bridges that shelter you as you hustle along toward the goal. It's a fun mechanic that starts out deceptively simple before throwing some fun items for you to play with. In some stages, you receive a large boulder that protects you in two ways: crouching in the lee of the stone, and by extending a shadow outward depending on how you twist the island. In another level, I crossed a village square by manipulating the island to stitch together tiny shadows from carriages scattered around the space, like a frog hopping from pad to pad. A few flaws in Shadow Vamp's execution make avoiding those rays harder than it needs to be. The virtual d-pad doesn't always respond quickly enough, leaving your undead avatar standing stupidly in the sun's path. Played from an overhead view, the game often puts you under a bridge--which seems safe, except the camera doesn't scoot forward enough to let you see where you'll be walking into sunlight or shadow when you leave your safe haven. Geometry can also prove deadlier than garlic cloves; graze the corner of a building and you might get snagged, fussing with the controls while the sun feeds on you like... well, like a vampire. Trial and error and pricey IAP pose the biggest problem. I was only able to solve some puzzles by stepping out into the open to take a look around and see how I should adjust the shadows. Allowing even a sliver of sunlight to touch your gets your vampire hot under the collar. That would be fine if not for the rabid thirst with which the sun attacks your HP bar, and the lack of a checkpoint system. Not that Shadow Vamp doesn't give you a helping hand. Side roads hold power-ups such as sunscreen that grants temporary invulnerability and bottles of blood that restore life. Each level also contains coins you collect to buy power-ups and unlock new vampires, each with unique strengths such as greater resistance to sunlight and a quicker gait. You never seem to collect enough, though. Vampires cost thousands of coins each, leaving players to confront that staple crossroads of mobile game design: replay levels to grind for cash, or buy coin packs with real money. In fairness, the asking price ameliorates most of those nitpicks. A distinctive blend of strategy and puzzle-solving flows through Shadow Vamp's blood. Sometimes it just takes a fair amount of flicking and slapping to find the vein.